One of the most important theological resources for my PhD-research is Philip Hefner‘s theological-anthropological work, mainly his concept of ‘created co-creator’. 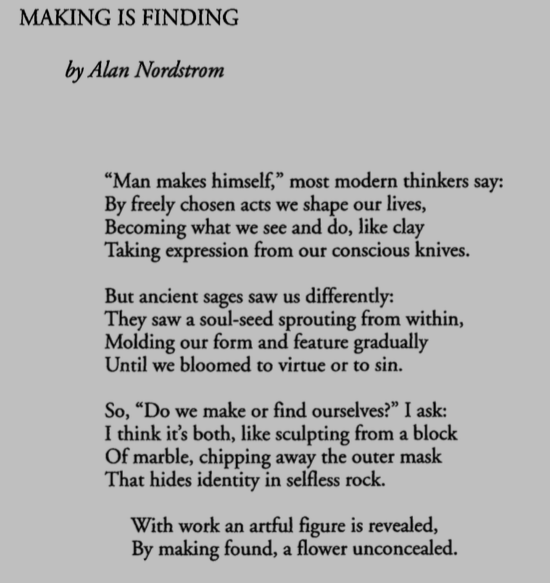 Perhaps one of the most captivating introductions to this concept has been written by Alan Nordstrom, in his poem ‘Making is Finding’. It has been published in Zygon, just over ten years ago, as part of a thematic issue. I stumbled upon it today, while skimming through some notes I made earlier. Most articles can be downloaded for free, so I guess there’s no harm in posting a copy of the poem here. Enjoy! Posted in Little Reflections. Tagged Anthropology, Philip Hefner.